1. Preheat a griddle over a medium–high heat. Lightly drizzle the bread on both sides with oil and cook for 1–2 minutes each side until charred. 2. Meanwhile, combine the ricotta, honey and a little freshly ground black pepper in a bowl. 3. Spread each piece of toast with the ricotta mixture. 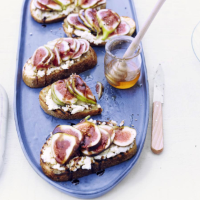 Slice or tear the figs and divide among the toasts. Drizzle with more honey and balsamic, then finish with freshly ground black pepper to serve. This recipe was first published in July 2015.